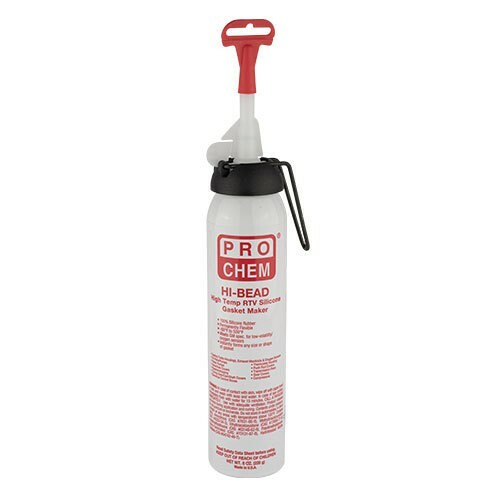 HI-BEAD | Pro Chem, Inc.
HI-BEAD RTV adhesive/sealant will bond, caulk, seal, fasten, insulate, protect and repair many types of materials. Because it is virtually unaffected by weather, temperature extremes, chemicals, and aging, it offers unmatched performance when under the most severe operating conditions. This material also seals or replaces a wide range of cork, paper, asbestos, felt, and metal gaskets. It works on flanges, cover plates, hose connections and threaded assemblies. Remove old gaskets, all oil and grease, and dry the surface. Apply fingertip pressure to stem and lay a thin, even bead (1/16” to 1/8”) to one mating surface, encircling all bolt holes. Allow bead to “skin” (approx. 15 min.) before assembling parts. Assemble carefully and do not over tighten bolts. If tooling is needed, complete within 5 minutes. Remove excess sealant immediately with dry paper towel or knife. If entire contents are not used, extrude 3/8” of sealant beyond nozzle opening. When ready to use again, twist and pull out cured plug. NOTE: Most paints do not adhere well to this sealant. Complete painting before application. This product does not adhere well to oily woods such as teak, cedar, and cypress. DO NOT USE ON head gaskets and carburetor base gaskets.